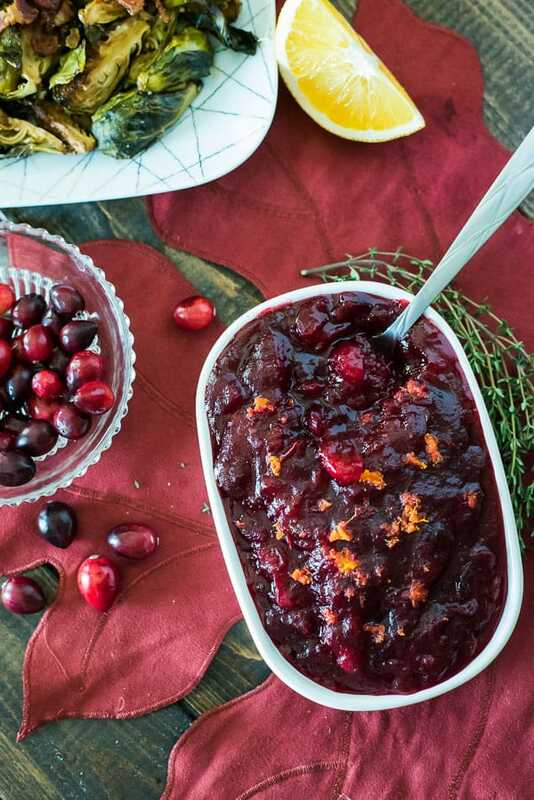 Never open a can of jellied cranberries again! 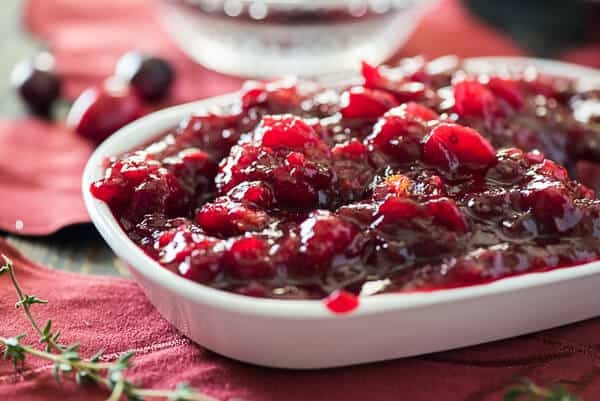 This quick Last-Minute Cinnamon Cranberry Sauce is so simple, you’ll be volunteering to bring the sides to every holiday dinner! Well. America, tomorrow is Thanksgiving Day. 2016 has arguably been one of the darkest years I can remember. In spite of all the negative, we should take tomorrow (and the rest of the holiday season, if you ask me) to reflect on the good things in our lives – every cloud has a silver lining, even the stormiest ones. 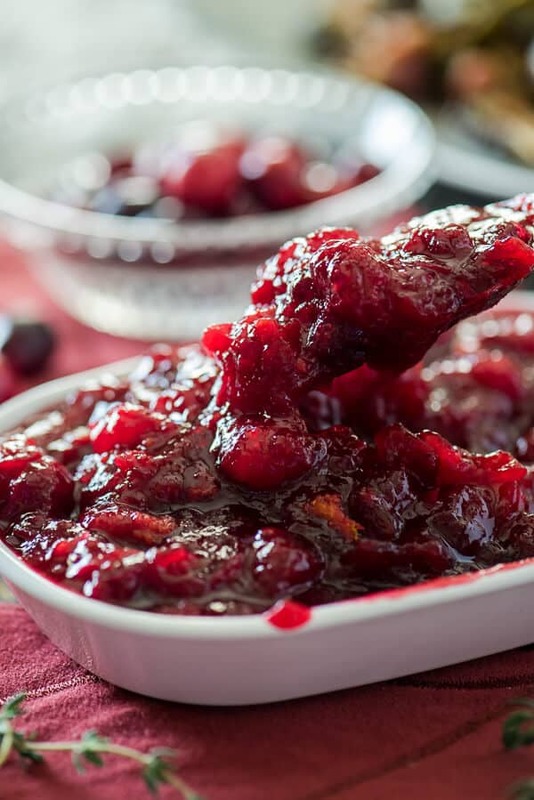 As I write this, my vacation, buying my new bed on Black Friday, post-dinner coma Cards Against Humanity, and this cranberry sauce are all part of my silver lining! 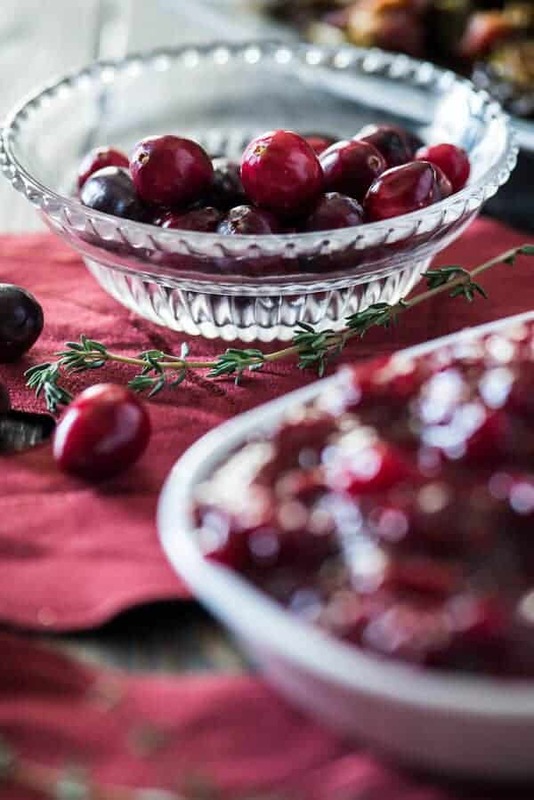 I’ve already admitted to loving cranberry sauce this week, especially the canned, jellied kind. Honestly, there’s just something about the stuff. Maybe it’s the tangy flavor; possibly it’s the fact that it retains the exact shape of the can it comes from. Mostly, I think it’s because of how nicely the slices fit on a turkey sandwich. 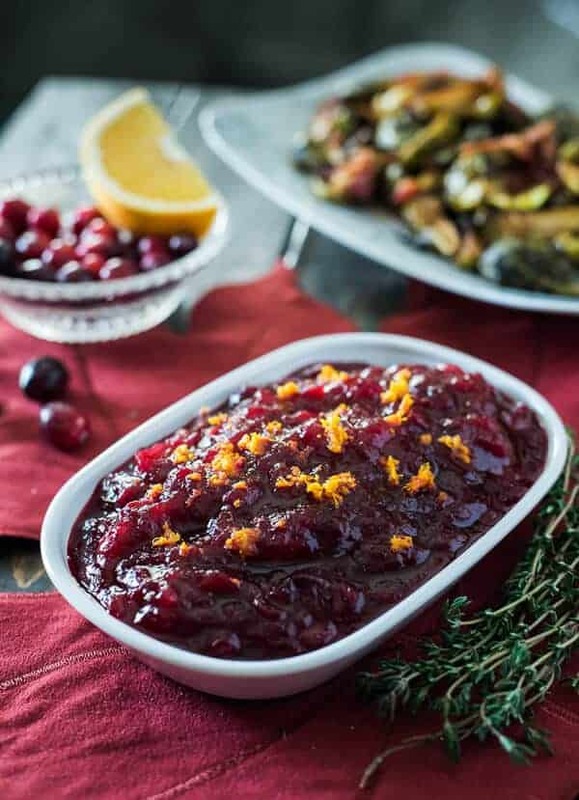 That said, don’t go smashing it up with a fork to make it look more “real.” If real cranberry sauce is what you want on your holiday table…then just make real cranberry sauce. I promise, it’s not hard, and you can make it right before dinner! 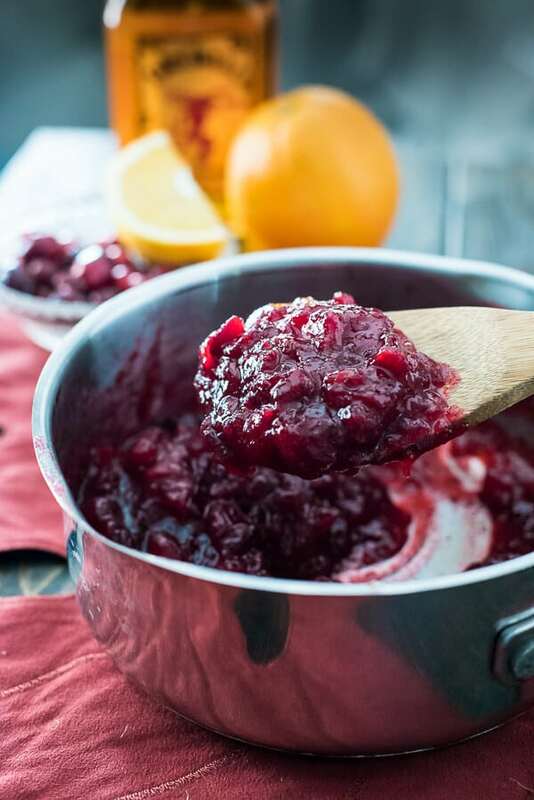 A handful of ingredients, 20 minutes, some stirring and satisfying berry smashing, and a little (or a lot if you’re into it) cinnamon whiskey and you’ve got yourself a flavorful, authentic, possibly boozy cranberry sauce to set before your hungry crowd. It will look so darn pretty next to the pièce de résistance and all those starchy, buttered side dishes. That bright, vibrant red is such a welcoming sight among so much drab brown and white. Just make sure you make enough to keep all the cranberry fans happy! I always keep a bag or two of cranberries in my freezer for this very reason, but I’ve been known to make this on a whim in the middle of summer, too. Of course, I guess if you run out, you could always sub in some smashed canned stuff. I would totally still dig in. Combine all ingredients in a medium saucepan set over medium-high heat. Bring to a boil, then reduce to a simmer, stirring occasionally, until berries start to pop. Use a wooden spoon to mash berries against side of pan, continuing to stir until berries are broken down and sauce has thickened, 10-15 minutes. Remove from heat and allow to cool to room temperature, about 30 minutes. Stir in additional cinnamon whiskey to taste, if desired. Remove cinnamon sticks and serve immediately or store covered in the refrigerator.